The colony of Gentoo penguins that reside alongside the British post office on the Antarctic Peninsula at Port Lockroy generate a bundle of mail. Photo © Ruth Peacey. 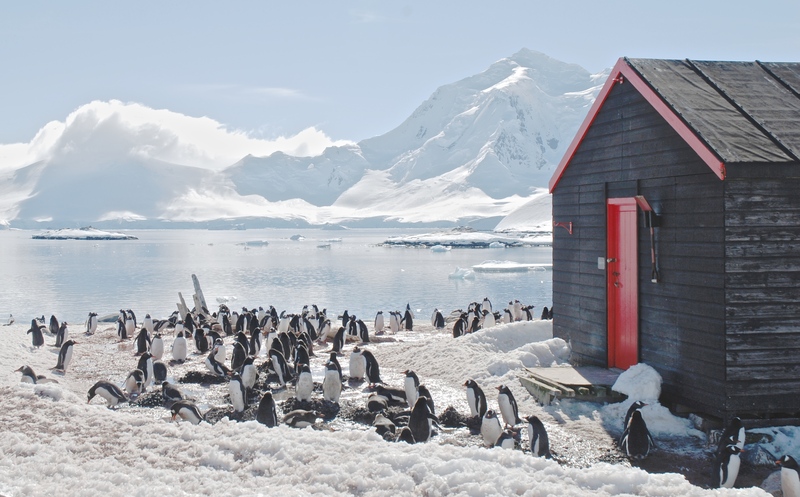 For a remote outpost on the Antarctic Peninsula, Port Lockroy boasts a booming tourist season, a full service post office, spectacular vistas and a colony of some 3,000 whimsical locals with short legs and big feet. During four summer months each year (November through early March), a handful of dedicated volunteers from the UK Antarctic Heritage Trust do triple duty in the post office/museum/gift shop as shiploads of tourists from around the world descend upon the pristine landscape. They come specifically to photograph the region’s population of Gentoo penguins in their breeding grounds immediately surrounding this former British research center. 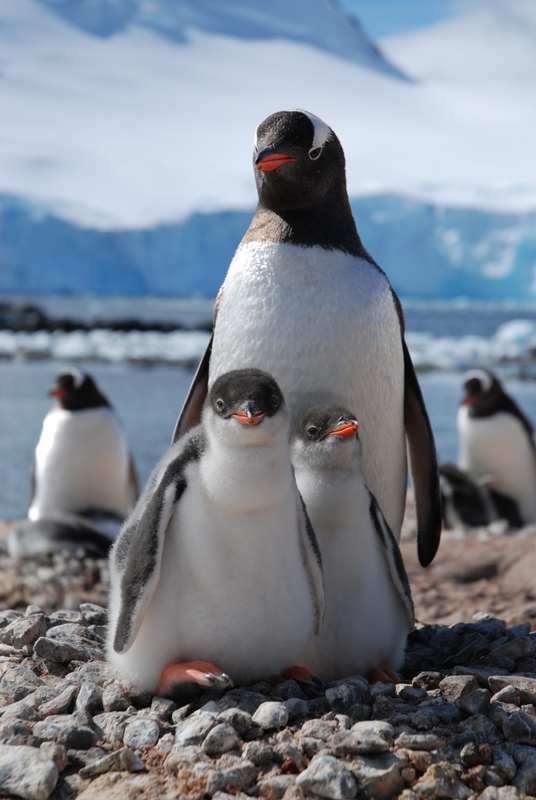 A Gentoo family primps for the camera. Photo © Ruth Peacey. Penguin Post Office, filmed and directed by wildlife cinematographer Andrew Graham-Brown and producer Ruth Peacey, documents four months in the pint-sized Gentoos’ circle of life as they descend from their deep sea fishing grounds, trek up to two miles across sea ice and snow to reconnect and breed with their mates at Port Lockroy. The cameras record the penguins’ methodical nest building, courtship and procreation, as well as the birthing, care and feeding of their chicks. As we’ve come to expect from penguins, they are adorably camera friendly, and yet their behavior can take a dramatic, aggressive turn. The rank-and-file team up, sometimes unsuccessfully, to fight off hungry aerial predators ready to feast on unhatched eggs and vulnerable baby chicks. Gentoo nests, mates and chicks are also the target of marauders from within their ranks. Unattended nests, methodically constructed stone-by-stone, are pillaged by lazy neighbors. Juveniles that clumsily wander into the wrong turf are bullied, and often killed by Gentoo gangs. And spouses are seduced away from longtime mates. But we also witness comic redemption and tenderness, when, for example, one penguin sets her mate straight as she drives off his new lady love, and a juvenile comforts and mourns its maimed and murdered sibling. Gentoo penguins settle down in their remote and ravishing summer breeding grounds. Photo © Ruth Peacey. Four months of the penguins’ lives unfold in this breathtaking, icy blue landscape at the end of the Earth, as tens of thousands of tourists arrive to photograph the penguins, buy penguin-themed souvenirs and send postcards back home as mementos of their brief but unforgettable visits. The penguins seem unperturbed by this human parade. While the tourists and their cameras are always kept at a safe distance, the birds seem to happily “pose” for photos and stand fearlessly side-by-side with the staff as they wash penguin waste from the rocky cliffs and maintain the exterior of the outpost. The camera periodically pulls back in extreme long shot to reveal the post office and out-buildings as tiny red and rustic specks engulfed by the overpowering landscape of sparkling white clouds, ethereal mountains and crystal blue water. That there are a handful of humans sharing this little red speck with a hardy colony of penguins for four months out of every year is mind-boggling. As with the considerably more substantive March of the Penguins (2005), Penguin Post Office shows that by shining a light on wildlife habits and habitats (via film and controlled tourism), we educate and encourage commitment to respect and protect these habitats. 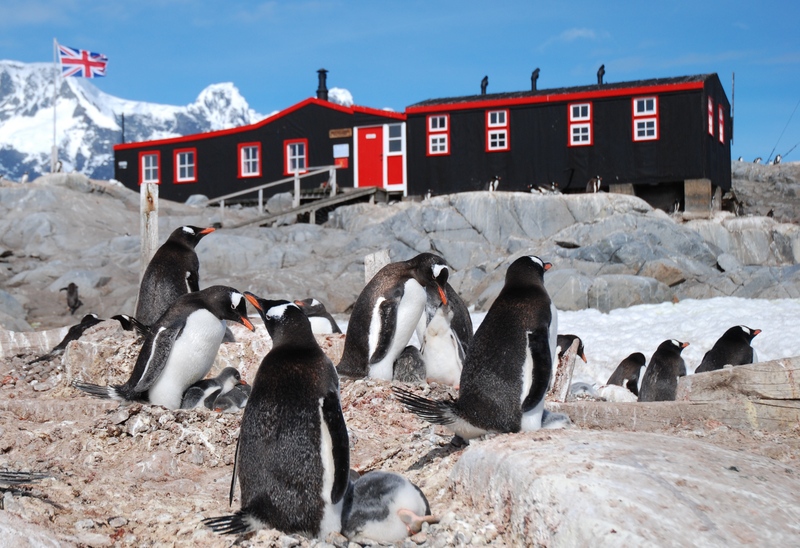 Despite its old-school voice-over narration, Penguin Post Office should captivate extreme travelers, armchair travel buffs, birders and animal lovers of all ages with its introduction to an exotic travel destination and the awe-inspiring Gentoo penguins that call it home. 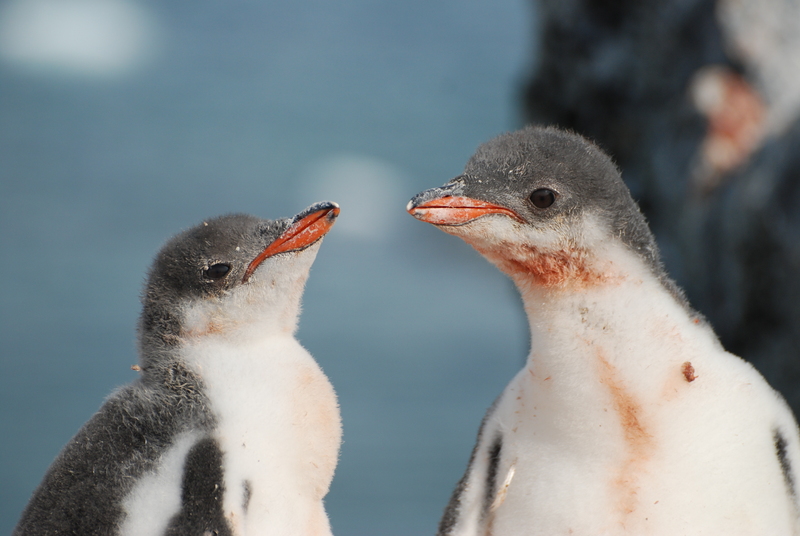 A couple of Gentoo chicks survive some blows and take their bows. Photo © Ruth Peacey. This entry was posted in TV and tagged Andrew Graham-Brown, Antarctica, Birds, March of the Penguins, NATURE, Nature & Wildlife, Penguin Post Office, Penguins, Port Lockroy, Tourism, United Kingdom Antarctic Heritage Trust. Bookmark the permalink.